It's almost time to pull out the beachwear! Are you ready? It’s almost time to pull out the beachwear! Are you ready? Almost everyone has unwanted hair somewhere on his or her body. Unfortunately, traditional hair removal routines can be tedious, painful and expensive over time. Shaving may last a day, waxing a couple of weeks and electrolysis is especially painful and can take forever! Therein lies the true beauty of laser hair removal. Laser hair removal can remove unwanted hair faster and more effectively than traditional methods. It is also THE MOST safe and effective method for treating large areas with thicker, course hair- such as legs, backs and chest areas. Laser hair removal can be performed on all areas of the body and on all types of skin. 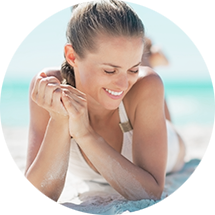 At Dermatology & Laser of Del Mar we utilize GentleMAX® laser technology (Candela laser). This innovative new technology offers dual wavelengths to safely treat even dark skin types! The laser treatment causes only minimal discomfort. Patients often say it feels similar to the snap of a rubber band. A topical numbing agent such as LMX may be applied 30 minutes prior to treatment for added comfort. Very slight redness or localized swelling may occasionally occur, but this usually subsides within the first 24 hours after treatment. Typically patients will see results in even one treatment although four treatments, roughly eight weeks apart, are recommended for optimal results. The exact number will vary based upon skin tone, hair color and several other factors. 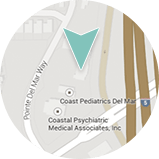 Every treatment is individualized to meet a specific patient’s needs. After your treatment series, you will be able to maintain a smooth, hair free appearance with simple maintenance. Scheduling your complimentary consultation! Deborah H. Atkin, M.D. will talk to you about removing unwanted hair and the importance of customizing a treatment for your skin tone and hair type. Dr. Atkin will talk to you about variables that may affect your individual results. If you would like to schedule an appointment for this treatment, or would like additional information, please contact Dermatology & Laser of Del Mar at 858-350-SKIN (7546) or find us at www.dermdelmar.com.